WeChat’s widespread appeal is unmistakable. With over 900 million monthly visitors and a highly active user base sharing content on a daily basis, it’s no wonder brands are eager to get on the platform in order to reach coveted Chinese audiences. But which brands on WeChat have created successful advertising campaigns that stand out from the crowd? 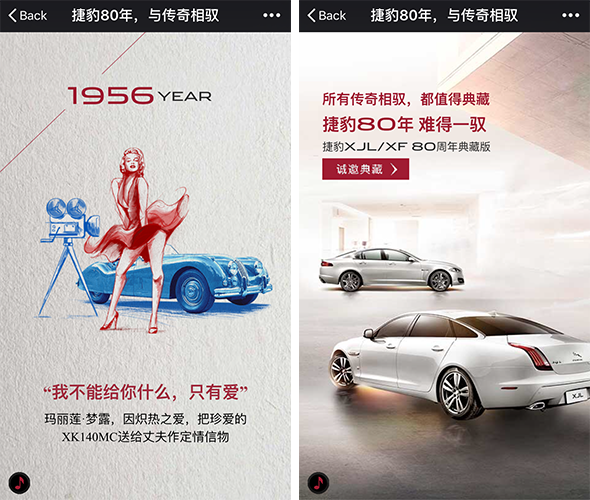 Here are the top 10 brands that have set the bar high advertising on WeChat. 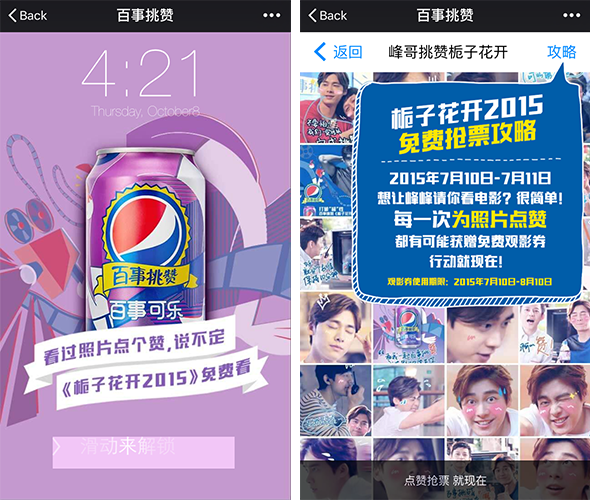 Pepsi is a great example of how a CPG brand can thrive on WeChat. In collaboration with Chinese actor Yifeng Li, Pepsi ran a WeChat advertising campaign to promote Li’s movie, “Forever Young”. Users who liked his photos were eligible to win “Forever Young” movie tickets. The ad was targeted to Chinese millennials, including fans of Yifeng Li. KFC wanted to increase awareness for their newly launched coffee service, similar to McCafe at McDonald’s. The QSR brand created an interactive experience by running a WeChat advertising campaign offering a limited number of exclusive edible coffee cups. Fans scanned QR codes at bus stops to receive a digital coupon for a free edible cup. The ads were targeted to locals in Shanghai, driving trial among new customers and engaging with existing fans. Levi’s kicked off digital promotion of their women’s denim line with a WeChat advertising campaign featuring spokesperson Alicia Keys. In the video, Keys introduces the new collection and talks about how incredible and powerful a woman could be. She takes Levis fans behind the scenes to share how the philosophy behind the collection was to bring out the beauty of women. 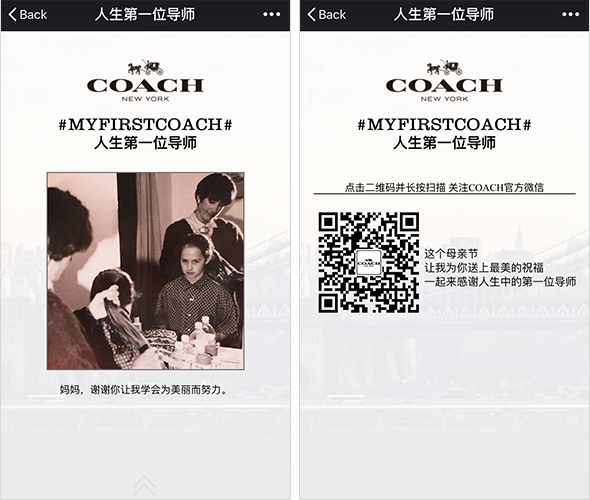 To celebrate Mother’s Day, Coach ran a WeChat advertising campaign named #MYFIRSTCOACH#, addressing how mothers are the first ‘coach’ in a young girl’s life. The ad used an emotional approach to reach out to mothers and daughters. Coach is wildly popular among the middle-aged generation in China and is well-loved as a top choice of gifts for Chinese mothers. Their WeChat advertising campaign proves that the brand isn’t just for the older demographic. Chanel promoted their lipstick line on WeChat by asking fans to share their favorite lipstick color. 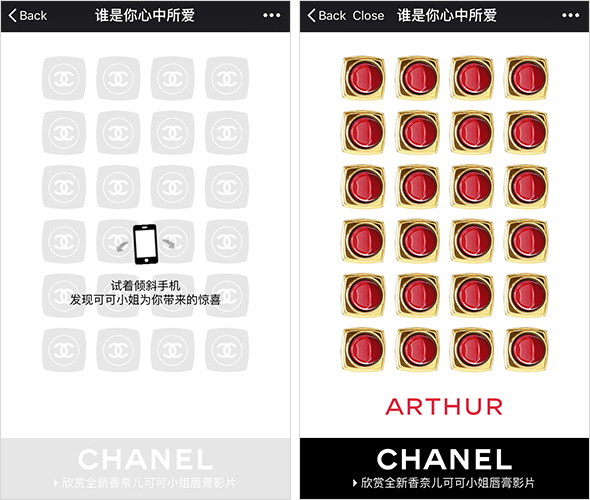 The luxury brand’s WeChat advertising campaign allowed users to shake their smartphones and view the color changes between Chanel lipsticks. This interactive approach integrates the app’s unique features, which add an element of fun to customer engagement. Tencent’s Sophia Ong acknowledges that “Chinese consumers, especially those who were born after the 1980s and are looking at luxury brands, have a high demand for customized and personalized products and experiences.” (AdAge). 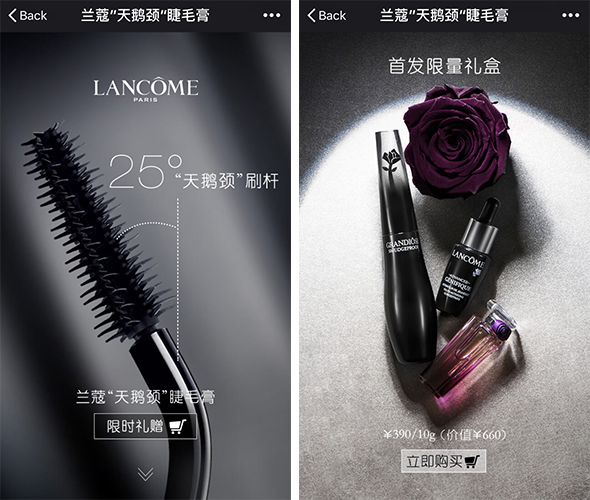 With the launch of a new product – the Swan-Neck Wand Mascara – the beauty giant ran a WeChat advertising campaign to introduce the mascara’s new features. People who click this ad will be redirected to a micro eCommerce site to buy this product and limited edition gift sets that contained the product. The luxury market on WeChat continues to grow, and the platform has now been used by a large number of western fashion and beauty brands, including Louis Vuitton, YSL, Michael Kors, and Burberry. Jaguar wanted to increase awareness of their XJL/XF special edition models, as well as celebrate Jaguar’s 80th anniversary. Their campaign reviewed Jaguar’s collaboration with celebrities over past 80 years, including Marilyn Monroe’s Jaguar XK140MC, Prince William’s Jaguar XJ wedding car, Jaguar cars in James Bond movies, and more. Fans could even book a test drive of the Jaguar XJL or XF through the ad. 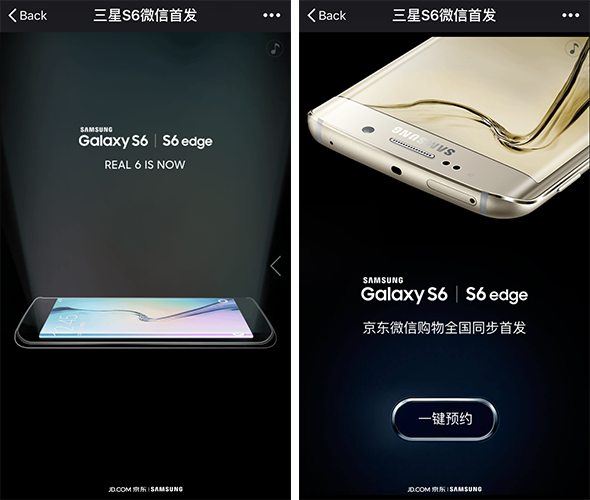 Samsung partnered with Chinese eCommerce website JD.com to debut the Galaxy S6 edge on WeChat. The campaign introduced the highlights of the phone. With just one click, fans could reserve an S6 edge online by redirecting to JD’s website. JD.com is the eCommerce partner of Tencent, second only to Alibaba. WeChat sees strong communities forming around entertainment and pop culture. 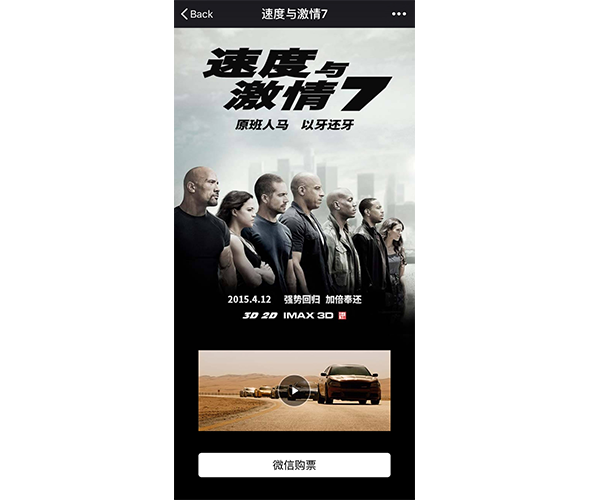 To increase ticket sales for the Furious 7 movie, a WeChat advertising campaign promoted the trailer and drove traffic to the online ticket office. This is an example of hosting a video on an HTML5 site. FC Bayern has nearly 90 million followers in China, who jumped at the opportunity to see one of the best football teams in the world during the Audi Summer Tour in China. 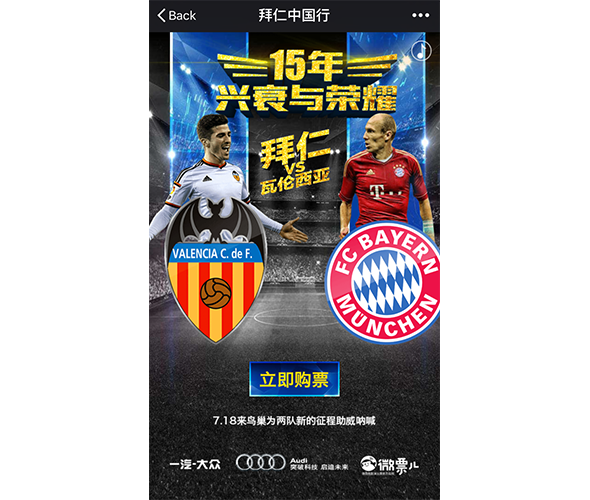 FC Bayern wanted to boost ticket sales for the high-profile Bayern Munich vs. Valencia match at Beijing National Stadium. 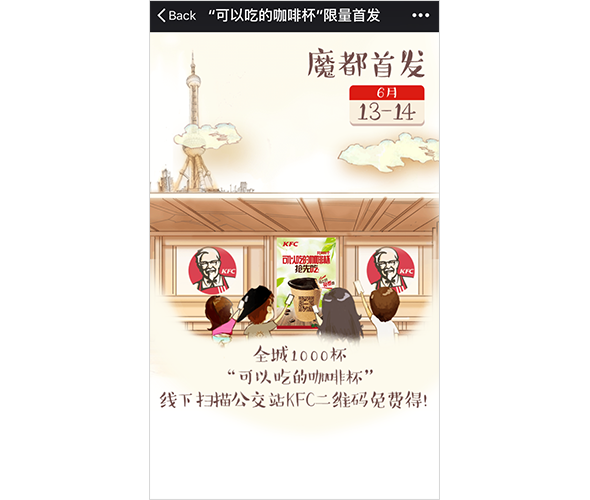 Their WeChat advertising campaign redirected fans to a microsite to purchase tickets. People who bought tickets through this ad had the opportunity win FC Bayern souvenirs. As the platform evolves, we will continue to see brands on WeChat use the channel in new and innovate ways. As always in social media, content is king. Brands on WeChat have an effective platform to focus on their fans and engage with them via targeted advertising campaigns. WeChat users are eager to share content, and including the channel in your brand’s marketing mix can be very effective — at Sheng Li Digital, we have run some very successful campaigns using WeChat advertising. Download our WeChat advertising guide or contact us directly to learn how your brand can get started.